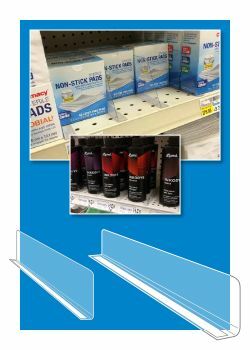 15 mil thick for 1" and 20 mil thick for 3"
Econo line shelf dividers and organizers from Clip Strip Corp. are afforable shelf organizers that make it easy to merchandise and display products at retail. We have 2 height sizes and many lengths to choose from, all clear and they make for easy maintenance. Separating your products on shelving and having clear demarkation between items makes the user experience much easier and the purchase frequency go up. Choose between Adhesive mounting or Magnetic mounting. Without the utilization of Shelf Dividers in-store, the average shopper has a hard time placing products back where they belong creating a bad experience for the next shopper, which can equal lost revenue. And your retail store staff spends lots of labor time re-merchandising. Use our shelf dividers and stop this cycle that hurts your user experience. Clip Strip Corp. manufactuers a complete line of store fixtures and display materials for product merchandsing, helping our brand customer's products sell faster than the competition and our retail customers by helping to communicate easily to its patrons and by aiding in moving product efficiently out of the store. Let us help you achieve your goals, give is a call today at 1-800-4-CLIP-STRIP, ask for free samples, we are here to help! 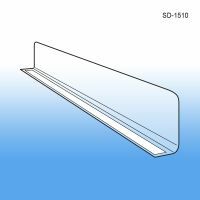 Minimum quantity for "Shelf Divider, 1" H x 9-9/16" L, Adhesive Mount, SD-1510" is 25. 1" H x 11-9/16" deep, clear w/ adhesive mount. 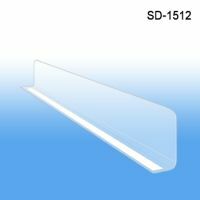 Minimum quantity for "Shelf Divider, 1" H x 11-9/16" L, Adhesive Mount, SD-1512" is 25. Minimum quantity for "Shelf Divider, 1" H x 13-9/16" L, Adhesive Mount, SD-1514" is 25. 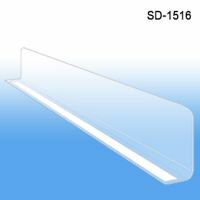 Minimum quantity for "Shelf Divider, 1" H x 15-9/16" L, Adhesive Mount, SD-1516" is 25. 1" H x 17-9/16" deep, clear with adhesive mount. Minimum quantity for "Shelf Divider, 1" H x 17-9/16" L, Adhesive Mount, SD-1518" is 25. 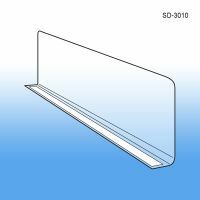 Minimum quantity for "Shelf Divider, 3" H x 9-9/16" L, Adhesive Mount, SD-3010" is 25. 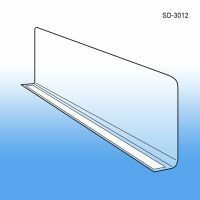 Minimum quantity for "Shelf Divider, 3" H x 11-9/16" L, Adhesive Mount, SD-3012" is 25. 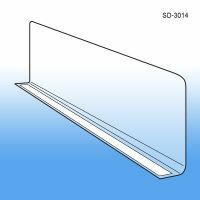 Minimum quantity for "Shelf Divider, 3" H x 13-9/16" L, Adhesive Mount, SD-3014" is 25. 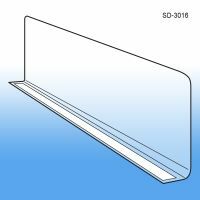 Minimum quantity for "Shelf Divider, 3" H x 15-9/16" L, Adhesive Mount, SD-3016" is 25. 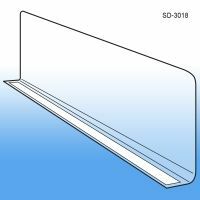 Minimum quantity for "Shelf Divider, 3" H x 17-9/16" L, Adhesive Mount, SD-3018" is 25. 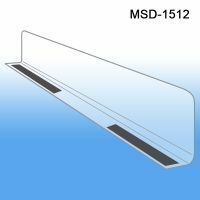 Minimum quantity for "Shelf Divider, 1"H x 11-9/16" L, Magnetic Mount, MSD-1512" is 25. 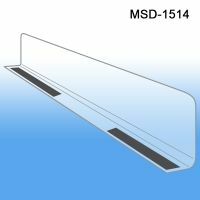 Minimum quantity for "Shelf Divider, 1" H x 13-9/16" L, Magnetic Mount, MSD-1514" is 25. 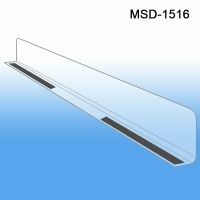 Minimum quantity for "Shelf Divider, 1" H x 15-9/16" L, Magnetic Mount, MSD-1516" is 25. Minimum quantity for "Shelf Divider, 1" H x 17-9/16" L, Magnetic Mount, MSD-1518" is 25. Minimum quantity for "Shelf Divider, 3" H x 9-9/16" L, Magnetic Mount, MSD-3010" is 25. 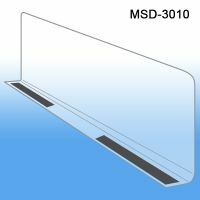 Minimum quantity for "Shelf Divider, 3" H x 11-9/16" L, Magnetic Mount, MSD-3012" is 25. Minimum quantity for "Shelf Divider, 3" H x 13-9/16" L, Magnetic Mount, MSD-3014" is 25. Minimum quantity for "Shelf Divider, 3" H x 15-9/16" L, Magnetic Mount, MSD-3016" is 25. Minimum quantity for "Shelf Divider, 3" H x 17-9/16" L, Magnetic Mount, MSD-3018" is 25.